SR Education Group, an online education research publisher based in Kirkland, Wash., released a major expansion to the rankings on their site OnlineU.org: The 2015 Top Online Degrees. The new release ranks the best online colleges in the nation across seven popular online degree subjects: computer science, social work, MBA, nursing, education, accounting, and engineering. University of Southern California, North Carolina State University, and University of Florida rank the most frequently across all subject areas, making their mark on four out of seven degree rankings. SR Education Group researched several hundred schools’ program data, programmatic accreditations and tuition rates in order to get the most accurate list of online degree offerings currently available. For The 2015 Top Online Degrees rankings, schools were first limited to colleges or universities with degree-specific accreditation. For instance, schools needed top tier business accreditation to be considered for The 2015 Top Online MBA Degree rankings. After meeting accreditation requirements, most of the rankings were ordered using a proprietary formula that considers the strength of the student body, desirability of the school and other quality factors. In the case of The Top Online Accounting Degrees, a success metric (in this case, the CPA pass rate) was used instead to rank the schools. Similarly, in the Top Online Nursing Degrees rankings, all of the schools had to have above a 90% pass rate on the exam students must take after graduation to become a registered nurse in order to qualify. All of the 77 schools on The 2015 Top Online Degrees rankings are fully accredited and offer degrees fully online, or almost entirely online with minimal in-person requirements. Schools with programs that require some on-­campus coursework were still considered if the amount of in­-person work was limited enough to reasonably allow students to retain their current employment or other personal responsibilities. The top schools vary greatly depending on the program of interest and, therefore, OnlineU’s methodology can be valuable for any student who knows what he or she wants to study. 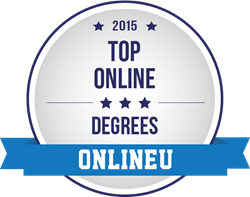 Visit http://www.onlineu.org to view each of the seven 2015 Top Online Degrees and their respective school rankings.